Get assistance and receive answers to your questions quickly. How do I add my picture or avatar to show next to my comments? How will I know if someone replies to one of my comments? Where do I find additional products available for sale from Revolution Golf? Where can I get the Revolution Golf Mobile App? I need help using the app. What is the refund policy for a In-Depth content or for an RG+ Mobile Subscription? What is the difference between an RG+ Mobile Subscription and a GOLFPASS Membership? What will happen to my membership starting 01/28/2019? What are the different levels of GOLFPASS membership? What are the benefits of GOLFPASS program? What are the benefits of GOLFPASS+ program? What do I receive when I become a GOLFPASS member? Where can I use my GOLFPASS membership to receive the benefits? Who is eligible to become a GOLFPASS or GOLFPASS+ member? What is GOLFPASS and GOLFPASS+ membership fee? How do I enroll in the GOLFPASS or GOLFPASS+ program? How do I pay for GOLFPASS or GOLFPASS+ membership? How long does the GOLFPASS or GOLFPASS+ membership last? What are the Terms and Conditions of the program? How do I cancel my GOLFPASS or GOLFPASS+ membership? Who can I speak to about my GOLFPASS or GOLFPASS+ membership? Can I combine my GOLFPASS or GOLFPASS+ membership with other GolfNow accounts? I am on GOLFPASS, can I upgrade to GOLFPASS+? I enrolled prior to February 05, 2019, what would happen to my membership? What if I do not want to auto-renew into the program? What are the Terms & Conditions for a Free Trial of GOLFPASS? Why won't my video play? How do I save a video to my favorites? How do I download a video? How do I search for a specific video when logged into the website? Where are my purchased videos? Where are my videos? I never got my DVDs. Where are my videos? I never got my DVDs? I tried to reset my password, why haven’t I received the email on how to change it? Why did my emails stop coming? How do I control what email "Alerts" I receive from RG.com? Why are there unexpected charges after my item has been delivered? How do I track my package without the tracking link? Where can I see my order status on RG.com? Hover your mouse over your name in the top right-hand corner of the screen. Click on the third item in the list that appears called ‘Account’. A new page will load with your account. On the bottom right-hand corner of the background picture, click on the "EDIT IMAGERY' link. Click the Choose File button to locate the image file you wish to use. Find the picture you would like to use and click Open. Click Upload New for your picture to change. When you log into your Revolution Golf account, hover over your name in the upper-right corner. There will be a number next to the ‘Unread Comments’ link, indicating that a response has been posted to your comment/question. You can also go to the Shop from any page on the website, by clicking on Shop in the top option bar. Download the Revolution Golf Mobile App on the Apple App Store for mobile and tablet devices (iOS 8.0 or later), Apple TV (4th generation or later), or on the Google Play Store for Android devices (4.1 or later). General instructions are available on our Mobile App User Guide available here. For purchases through the Apple App Store, In-Depth content and RG+ Mobile Subscriptions are subject to Apple’s 90-day refund policy. Please contact Apple support through https://reportaproblem.apple.com/. For purchases through the Google Play Store, In-Depth content and RG+ Mobile Subscriptions are subject to a 30-day refund policy. Please contact us with the details requested here at customerservice@revolutiongolf.com. 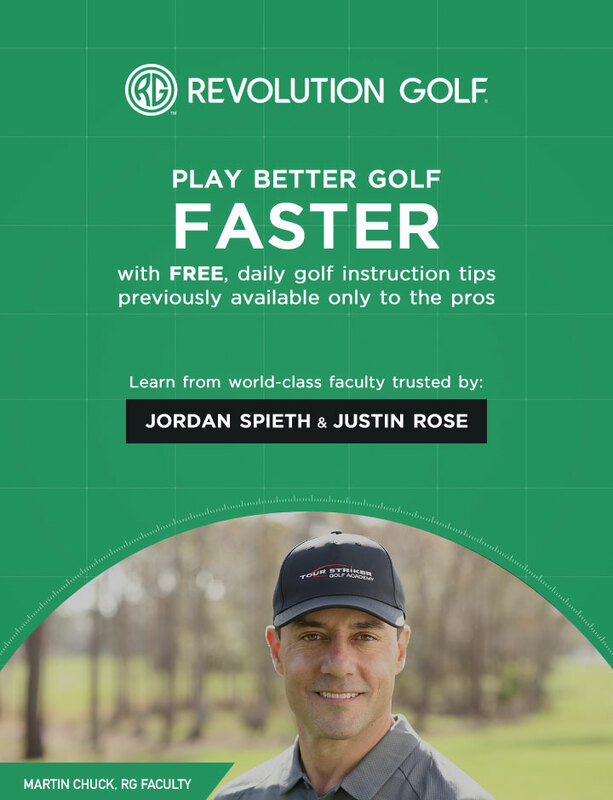 With an RG+ Mobile Subscription, you can access nearly 1,000 golf instruction videos from Revolution Golf’s world-class faculty. However, this access is limited to the app only. For enhanced access to all GOLFPASS Membership perks, including app access, please subscribe through revolutiongolf.com/join. Starting Jan 28, 2019 Revolution Golf, Golf Advisor Club and Golf Odyssey programs will become GOLFPASS Program and all members will have automatic access to their benefits on GOLFPASS. GOLFPASS is the one membership that connects golfers to every aspect of the game. With exclusive video, $250 in Hot Deals tee times, world-class instruction, travel tips, credit at popular resorts and other benefits included, GOLFPASS combines the very best of golf into one convenient, affordable membership. To become a GOLFPASS member, simply sign up via golfpass.com to the membership of your choice. GOLFPASS membership comes in different levels with different benefits. Members can choose to enroll in GOLFPASS or GOLFPASS+. GOLFPASS comes in monthly and annual membership options. GOLFPASS+ comes in an annual membership option. Click here for information on additional GOLFPASS benefits. Click here for information on additional GOLFPASS+ benefits. After signing up and becoming a GOLFPASS member, you will be entitled to any promotional offer available during the time period in which your GOLFPASS membership was initiated, along with all of the GOLFPASS membership benefits and perks. To see all of the membership benefits, click here. All GOLFPASS membership benefits can be explored on GOLPASS.com. PLAY benefits are available on GOLFNOW.com and GolfNow mobile app. GOLPASS+ members when making a tee time reservation, must be logged in to the GolfNow account associated with the purchased GOLFPASS+ membership in order to receive all of the GOLFPASS+ benefits. Please be sure to update your GolfNow mobile app to the latest version in order to view your membership information and take advantage of all the benefits available to GOLFPASS+ members. GOLFPASS and GOLFPASS+ membership is available to all golfers who reside within the United States and Canada. The membership fee for GOLFPASS and GOLFPASS+ is stated on https://golfpass.com. From time to time, we may offer different membership terms, and the fees for such memberships may vary. The membership fee is non-refundable, except as expressly set forth in these Terms and Conditions. To enroll, simply click here and follow the purchase instructions. You can pay for GOLPASS or GOLFPASS+ membership on GOLFPASS.com. All membership prices are stated in U.S. Dollars. Your GOLFPASS membership will remain in effect for one (1) month beginning on the date of your purchase. Your membership will automatically renew for one (1) month upon your renewal date. For example, if you purchase your GOLFPASS membership on February 5, 2019, your membership and the benefits associated with it will be available until March 5, 2019. At that point, your card will be charged automatically for renewal towards membership for another month. Your GOLFPASS membership will remain in effect for one (1) year beginning on the date of your purchase. Your membership will automatically renew for one (1) year upon your renewal date. For example, if you purchase your GOLFPASS membership on February 5, 2019, your membership and the benefits associated with it will be available until February 5, 2020. At that point, your card will be charged automatically for renewal towards membership for another year. Your GOLFPASS+ membership will remain in effect for one (1) year beginning on the date of your purchase. Your membership will automatically renew for one (1) year upon your renewal date. For example, if you purchase your GOLFPASS+ membership on February 5, 2019, your membership and the benefits associated with it will be available until February 5, 2020. At that point, your card will be charged automatically for renewal towards membership for another year. The GOLFPASS and GOLFPASS+ programs is an auto-renewal program. The credit card we have on file for you will be charged again for your membership in the program in order to ensure that your benefits are not interrupted. If all credit cards we have on file for you are declined for payment of your membership fee, you must provide us a new credit card promptly or your membership will be cancelled. If you provide us with a new card and are successfully charged, your new membership period will be based on the date of the successful charge. For a full list of terms and conditions of the GOLFPASS and GOLFPASS+ program, please click here. You can cancel your subscription via the following methods: (1) by contacting customer service via Telephone at 1-833-465-3847 (subject to call center hours), or (2) by such other means as we may provide from time to time. We will attempt to process all cancellation requests within 72 hours after we receive your request. If you cancel near the end of your billing period and are inadvertently charged for the next period's fee, contact customer service to have the charges reversed. No Refunds: Monthly GOLFPASS subscription payments are non-refundable and there are no refunds or credits for partially used periods. Annual GOLFPASS subscription payments are refundable only under the following circumstances: (1) You cancel your annual subscription within the first thirty (30) days of purchase; and (2) You have not used any available GOLFPASS membership benefits following Your purchase of the annual subscription. Except as set forth below, you will continue to have access to your subscription through the end of your current Subscription Period following any cancellation. All GOLFPASS and GOLFPASS+ members have access to an exclusive phone number they can call to speak with a GOLFPASS specialist. Members may call this number to book tee times, learn more about GOLFPASS or GOLFPASS+, cancel their membership, or to ask questions about benefits and any other inquiries related to the program. To speak directly with a specialist at our GOLFPASS or GOLFPASS+ support line, please call (833-465-3847). You may not combine or assign your GOLFPASS or GOLFPASS+ membership or any GOLFPASS benefits, including promotion codes for GOLFPASS memberships or benefits, to other GolfNow accounts. Effective January 28, 2019, all active Revolution Golf+ (“RG+”), Golf Advisor Club, and Golf Odyssey subscribers will be automatically transitioned to GOLFPASS memberships, and these subscribers will receive instant access to GOLFPASS benefits for the remainder of their applicable subscription period. Pursuant to the Subscription Agreement, these GOLFPASS memberships will automatically renew on the original renewal date of the User’s previous RG+, Golf Advisor Club, and/or Golf Odyssey subscriptions, unless notified otherwise. Effective January 28, 2019, all active GolfNow VIP members will be automatically transitioned to GOLFPASS + Memberships, and will receive instant access to GOLFPASS + benefits for the remainder of their applicable subscription period for no additional fee. Pursuant to the Subscription Agreement, these GOLFPASS+ Memberships will automatically renew on the original renewal date of User’s previous GolfNow VIP membership, unless notified otherwise. GOLFPASS Monthly: If you do not want your membership to automatically renew, you must turn off auto-renewal prior to your renewal date. Auto-renewal can be turned off by accessing Your Account on GOLFPASS.com, Membership management, Auto-renewal, Select “OFF”. GolfNow will send you a notice of renewal at least thirty (30) days prior to your automatic renewal date. If you do not want your membership to automatically renew, you must turn off auto-renewal prior to your renewal date or within (30) days of receiving GolfNow’s notice of renewal. Auto-renewal can be turned off by accessing Your Account, GolfNow Memberships, Auto-renewal, Select “OFF”. Clear your internet browser's cookies and cache/history. If the first 2 steps don't resolve your issue, try an alternative browser such as Google Chrome or Mozilla Firefox. After a different Internet browser is installed onto your computer, open the browser and go to our site at: https://www.revolutiongolf.com to try the video again. If you are an AVG user, it's possible that our streaming video content is being blocked by AVG. Open your internet browser and look for the AVG "eyeball." If using Mozilla Firefox or Google Chrome it will be in the top right-hand corner. If using Internet Explorer, it will be in the top center. Click the eyeball and then click settings. When that page comes up you will see a list of blocked services. Make sure that our streaming content provider, Brightcove, is not checked and then click save. Go back to Revolution Golf, refresh the page, and the videos should play. If these steps don't resolve your issue please send a detailed explanation of what you are experiencing, including the operating system/version you're on (i.e. Windows 7, Safari, etc.) and the browser/version you are using (i.e. Internet Explorer version 11.0.18, etc.) to Member Support so your issue can be addressed individually. Our videos are available to be added as a Favorite if you are a GOLFPASS member. Please keep in mind that every video is not available to be Favorited. For Daily Tip Videos there are 2 ways you can Favorite your video. Before you click on the video: If you highlight your mouse on the video, you will see 2 options appear in the top right hand corner of the video. To add it to your Favorites, please click on the Star. Once you have already clicked on the video: While viewing it, you can highlight your mouse over the video playing to get 3 options in the top right hand corner. To add it to your Favorites, please click on the Star. Many of our videos are available for download. To download one of our Daily Video Tips, you must be a GOLFPASS member. If you're not a GOLFPASS member but have purchased a video from us, you can download your purchased videos if you see the ‘Download’ link beside the video image. To download one of our Daily Video Tips or full-length lessons ensure that you are logged in with your username and password. If available for download, the video will have a ‘Download’ link in light grey below the video. To find a video, click on the Search icon in the upper-right portion of the home page, just to the left of your name. Then click on the words "What are you looking for?" and type in your search term(s) to find videos that match. Click on the word ‘Log In’ in the top-right corner of your screen. Login with your Email and Password. Once logged in, click on ‘My Videos’ in the top option bar and it will bring you right to your Purchased Videos. Once logged in, you’ll see ‘My Account’ in the top-right corner of the screen. Hover your mouse over this, then select ‘Videos’ from the menu. NOTE: Your most recent purchases will be at the top of the list, you may need to scroll down for any older video purchases you have made. If we didn't specifically collect your "Ship To" address or charge you a Shipping & Handling fee, then your purchase was for digital/online streaming content only. You own your videos online and can access them on an unlimited basis from anywhere in the world through the Internet. The order is completely online, so no physical DVDs are sent. You can also, once logged in, you’ll see ‘My Account’ in the top-right corner of the screen. If you tried to reset your password via the login page ‘Forgot your Password?’ link, you should receive an email with instructions on how to reset your password. We will update your password for you at that time, and send you an email with instructions on how to login. Login with your current Email and Password. The most common reason why members stop seeing our Daily Tips emails is that they are being routed to the spam or junk folder. Please ensure that your email program is set to allow messages from email@e.revolutiongolf.com and customerservice@revolutiongolf.com to be delivered to your in-box. It's also possible that you might have inadvertently unsubscribed with the "Manage Subscriptions" link located at the bottom of one of our emails. Open one of our previous emails and select the "Manage Subscriptions" link at the bottom. This will take you to a page where you can un-check the box in front of "I do not want to receive any more emails" and then click "update." Please add your email address after the = and press enter to go to the preferences for your revolutiongolf.com emails. To customize your email preferences, click on the "Manage Email Preferences" link at the bottom of any of our Daily Tips or promotional email messages. On the page that opens click on "subscriptions" and then make sure you have a check-mark on each eNewsletter you want to receive regularly. You can also use the link below to remove your email from our database. Please add your email address after the = and press enter to go to the preferences for your revolutiongolf.com emails. To ensure that our messages are not routed to your spam or junk folder, make sure your email program's settings are set to allow emails from email@e.revolutiongolf.com and customerservice@revolutiongolf.com are on your list of safe contacts. To control which messages, if any, you receive from Revolution Golf, click on the "Manage Email Preferences" link at the bottom of any one of our Daily Tip or promotional emails. The link will take you to a page where you can limit the kinds of emails you receive from us or remove your email address from our database completely by selecting "Unsubscribe from all". Put a check-mark in the little box in front of "I no longer wish to receive any future publications" and select the "Update" button below. For international customers, additional charges for customs clearance must be borne by the recipient; we have no control over these charges and can't predict what they may be. Customs policies vary widely from country to country; you should contact your local customs office for more information. After your order has shipped, you will receive a Shipping Confirmation email from us. If the link is available to click on, please click on that and it will bring you directly to your shipment progress. If the link is not available, please copy the tracking number that is listed in the email. From here, if it is pasted in the browser you use, in the address bar, and you click enter the browser will automatically recognize the tracking number and generate a new page. On this page it will list the possible Shipping Companies it could have shipped with, which is usually one. Click on the Shipping Companies name and it will bring you directly to your shipment progress. Under ‘Orders’ you will be able to see your most recent order and any order placed within the last 6 months. The best instruction, delivered daily directly to your inbox, for FREE. It’s never been easier to improve your game. I agree to receive messages from Golf Channel and NBC Sports Golf Brands. These brands include Golf Channel, Revolution Golf, Deal Caddy, Golf Advisor, Am Tour, Golf Channel Academy, GOLFPASS and Fit to the Tee. Please enter a valid email address. Please click the checkbox above to indiciate your consent.